Insights and advice to help you keep up with the increasingly fast pace of change in web design, brand design and social & digital media marketing. We've just launched a new website for a local covers band - Uncovered Ground. They are a great band and a singer who is also part of Turtlereality! Uncovered Ground play a mix of classic rock songs from bands like Pink Floyd, Bowie, The Doors, T-Rex and, as they say, many more! 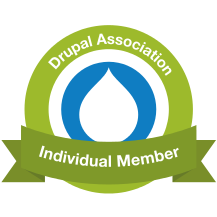 For a limited time, we are pleased to be able to offer free Security Audits for Drupal websites. Drupal has some of the toughest security of any CMS system available - but it also relies on being correctly set up and kept up to date. If your site has not been kept up to date with the latest security patches there is a chance your site has vulnerabilities or has been hacked. When we started out, a web site was very often made up of a collection of hard-coded HTML pages which linked to each other. It was a revolutionary new concept and very cutting edge. The web was where the cool kids hung out reading Wired magazine and checking Web Monkey on their Palm Pilots. A brand new, bespoke designed, mobile-friendly website for a small business on Exmoor. The Tantivy is a local institution but had a very poor internet presence. We've changed all that with a great new Drupal 8 website. As part of a major overhaul and redesign of their website, we have just opened a new e-commerce element for OUCH(uk) the UK national cluster headache charity. The e-commerce elements are linked to the charity's backend CiviCRM database to tie up all the information about purchases, donations, and memberships. Hopefully, this will further help the charity to prosper with a new revenue stream. Following our article 16 of the best Drupal 7 Modules, here is an up-to-the minute list of the best Drupal 8 modules. These are the ones we know will be vital on nearly any web design and development project. We've just launched another site for a thriving Wiltshire business. This is a Drupal 8 site for a Westbury-based company offering swimming classes with locations across the north and south of England.